If you’ve been looking for your 2017 summer soundtrack, we’ve got you covered. 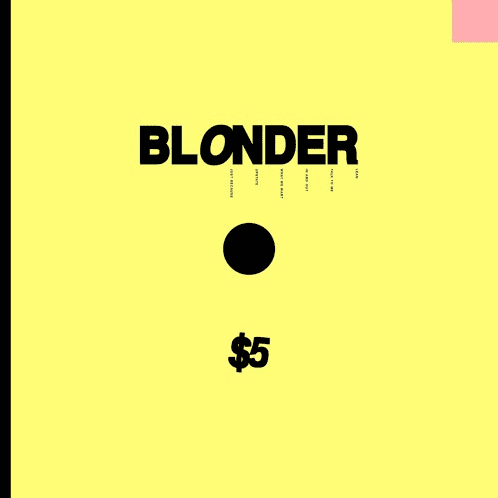 With these indie-pop beats from the New York City streets, Blonder’s debut EP $5 is sure to get you moving (and maybe even a little emotional). Artists with styles much like The 1975 have been well on the rise in the music scene, with danceable melodies and moody aesthetics spreading like wildfire in the mainstream. Here enters Blonder, a break in the musical status quo breathing a sweet and unique mixture of indie, rock, pop, electronic notes, and integrity. At first glance, $5 is brilliantly upbeat, smooth, and captivating. It isn’t until you give each song a proper listen, though, that you realize just how seamless of a novel the EP really is. Constantine Anastasakis, the mastermind behind Blonder, plays both the role of the iconic musician and the eloquent storyteller through these songs. From an emotive and sentimental “Lean” to lusty and wistful “What We Want”, the EP lays out the path of being in love as well as the symptoms of falling out of it (made eminent in middle-ground track “In and Out”). Anastasakis needs not to use metaphors for his feelings, and this lyrical honesty is what makes his music so vibrant and attractive (and of course, the groovy basslines and robust synth numbers). Blonder proves their potential with this promising EP release. While we’re more than satisfied with the fullness and lush of these songs, we are certainly ready for Blonder’s dominance in the music world. $5 is available everywhere today!